Podgorica, capital of Montenegro, a small country on the Adriatic sea, part of ex-Yugoslavia. With a population of just over 180,000 and having joined the map of the continent’s independent nations as recently as 2006, it’s one of the smallest major cities in Europe and one of its youngest capitals. Podgorica is a cool city, still almost untouched by international travellers; how many people can you think of who know where Montenegro is, let alone have been there? Let yourself flow along with the seductively relaxed tempo of Montenegrin life by following these tips by Podgorica locals and discover this underrated Balkan capital through their eyes. We’re willing to bet that no matter how many bars you’ve visited (probably not a small number), you’ve never actually been to one that actually doubled as a radio station – or is that the other way around? Radio Club Skadar has a rich alternative cultural program broadcasting at 107.9FM, which you can of course tune in to from everywhere in the city. With its extremely laid-back atmosphere, homelike decor (including old sofas) and free-roaming dogs, it’s a hotspot for the city’s artists and boheme locals. The music and general soundscape come straight from the live studio and there’s even a stage in the basement for (literally) underground rock concerts. Don’t be shy – start a conversation with the interesting people you’ll see there; it’s bound to result in a unique experience to talk about! Radio stations in bars are all nice and good, but what about a place where one can get a glass of great beer? Good news! There is a spot, and as far as we know it’s the only one, where you can get craft beer, so beer lovers: read up! Akademija Piva has six kinds of local brews, and if you’re not the kind of person who makes choices easily, for just €6 you can get a glass of all of them and go on a flight of Montenegrin beer-tasting. Don’t miss their sausages! Podgorica is a city that has a whopping five rivers running through it. The biggest one is Moraca, and in the ‘80s and ‘90s many would choose Galeb Beach for delving out into the icy cold waters of the river. Nowadays, the majority choose to go the sea instead, and the whole landscape has changed. You won’t see as big of a crowd here, but the central location of this beach yet its peace and quiet (combined with the great view of the picturesque surrounding bridges) make it ideal for a picnic with friends. Blok 5 (or ‘Blok V’), just next to monumental Temple of Christ’s Resurrection, is an equally monumental relic from another time, from socialist Yugoslavia in the early ‘80s. This neighbourhood is truly peculiar, with massive, irregularly shaped and coloured buildings – a true architectural marvel of its time. But that’s not all: Blok ‘Pet’ is one of the most organised and lively parts of the city even today, and a testament to how social housing, commerce, health care and education can be organised in a very rationalist manner. In a way, Blok V is an independent city within a city. There’s also plenty of true-blue neighbourhood cafes and restaurants in the area, such as Džada, where you can find people from all walks of life flocking from across the city. Blok V, one of the most interesting and unique parts of Podgorica, is a must-visit for any fan of brutalist architecture, or just architecture in general. Since it’s situated just above the beating heart of the city’s center, it’s very easy to reach. 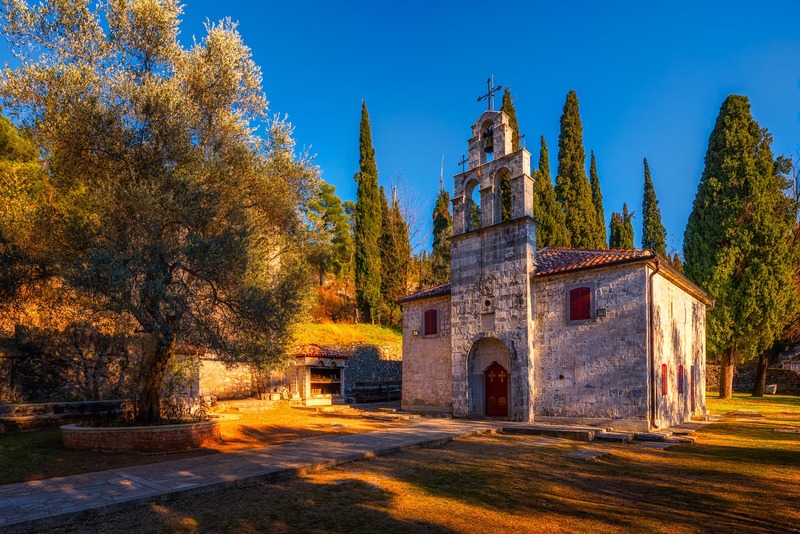 At the very entrance you can find St. George’s Church, Montenegro’s oldest Christian church and one of the oldest buildings in the city. Just a bit further up there’s cosily old-fashioned cafe/snack bar Klub Bocara, perfect for fueling up before the walk up the hill or for some rest after coming back down. With all this walking, by now you must have built up quite the appetite. Pod Volat is where many locals take international visitors for traditional Montenegrin cuisine, but it also ranks high among their own lists of favorite restaurants in the city. 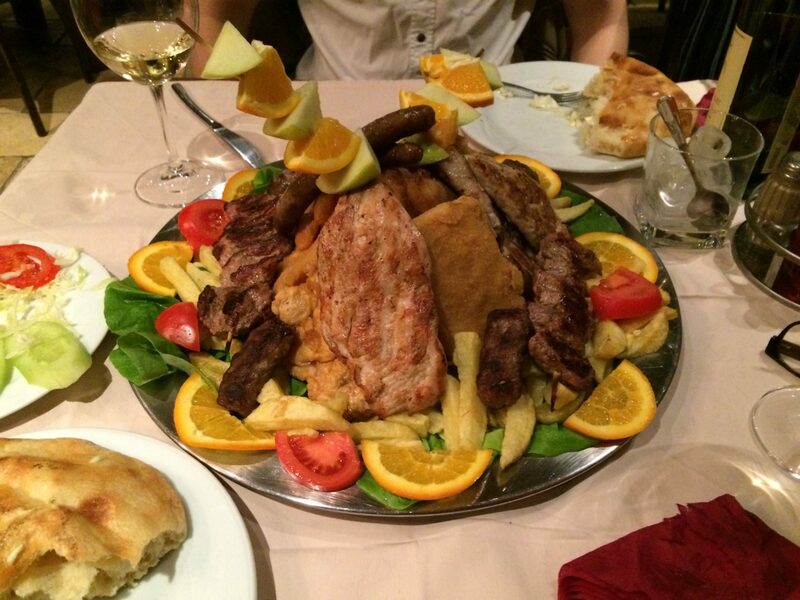 Take the chance to sample typical meat dishes (sorry, vegetarians!) or cooked meals for great prices or stay outside in the summer terrace, get some homemade cheese and bread, olives, tomatoes, and fries, and share a €5 bottle of wine with friends. This is the good life! You can reach Podgorica by hopping onto the Belgrade–Bar line (around 11 hours of travel), with Bar being Montenegro’s main port. Montenegro is one of the 27 countries included in the Eurail Global Pass, so make sure you stop by on your travels. For more local favourites across Europe, check out Spotted by Locals.